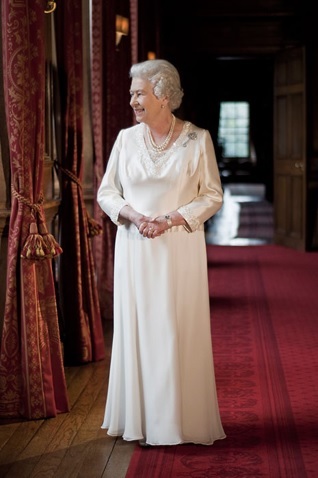 A new photographic portrait of The Queen was taken in 2010 and unveiled for the Scottish Parliament in 2011, featuring The Queen wearing - for apparently the first time - a unique diamond brooch. The brooch has the appearance of a key from afar, but up close it becomes a diamond thistle with two leaves forming a wreath and a long stem. 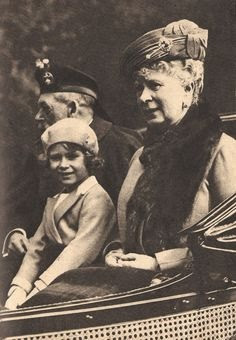 Information released with the new portrait identified the long brooch as a diamond thistle that belonged to The Queen's grandmother, Queen Mary. Despite not being worn until 2010, The Queen most likely inherited it along with much of the rest of Queen Mary's jewel collection on her death in 1953. 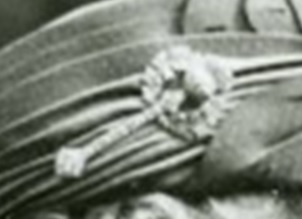 While Queen Mary wore the brooch pinned to one of her signature toque hats, The Queen has thus far worn it only in traditional brooch style on her shoulder. Both queens have capitalized on the thistle association and worn the brooch in Scotland. The brooch had to wait seven years for its next outing, at another Scottish occasion. This offers the first real opportunity to see this brooch in full detail. It's really quite beautiful, isn't it? I'd love to see it back in hat use, though that's not something I expect The Queen will ever do. This is one seriously unserious magpie cataloging the jewels of Queen Elizabeth II and The Duchess of Cornwall. Accuracy is the aim, but is never ever guaranteed. Chime in! Additional information and corrections are most welcome. Leave a comment and join the fun. For royal fashion, frivolity, and even more things that sparkle.